Websites without good content are pretty useless. By design, websites provide information about their subject – in this case, your business – to both visitors and search engines. This information can range from general information about your business, to specific details about your products and services. Without content, neither your visitors nor the search engines will know what you do, what you’re trying to convey or sell, how your business can help prospective clients, or what types of business problems you can solve. Content Marketing is CRITICAL to your business! Great content helps you get visitors to stay at your site longer AND improve your rankings in search results. Many times, websites appear flashy and contain bright colors and lots of photographs. They look great. Unfortunately, search engines can only read code and content. It’s similar to a person who is visually impaired and can only read braille. Without content, your story, products, services, and other important information you’d like to convey to visitors won’t be noticed. 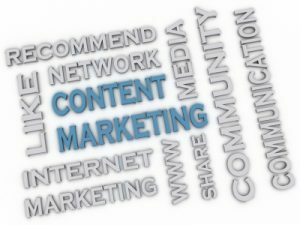 Explore our Content Marketing services and let us help establish your business as the industry leader in your field.